This Cheesy, Creamy Chicken Pasta Bake is sure to satisfy the fussiest of families eaters. Only 7 ingredients and surprisingly simple. A great combination of Chicken and Pasta, this is one of my favourites. I am sure that the kids will love this one. You can also hide some extra vegetables in there as well. With a couple of changes this recipe could also suit Vegetarians too. So you see, it’s easy, versatile and tastes great. Enjoy! Preheat oven to 200°C. Lightly grase and line a 5cm-deep, 20cm x 28cm (base), 8 cup capacity baking dish. Cook pasta in a large saucepan of boiling, salted water for 10 minutes or until tender. Meanwhile, remove chicken meat from the bone. Thinly shred meat. Discard bones. Drain pasta and return to saucepan. Add chicken, spinach, cream, tomatoes and 1 cup of parmesan. Toss until well combined. season with salt and pepper. Spoon mixture into prepared dish. Top with mozzarella and remaining parmesan. Bake for 20 to 25 minutes or until golden. Spoon pasta bake onto serving plates. Serve. Here we are again, yet another burger recipe. I told you I had lots of these, I can’t throw them out. So they will all be posted eventually. This one is slightly different from the others as it has a curry flavour to it. Great for Vegetarians but not so good for those with a nut allergy…sorry! I am sure that the peanut butter could be substituted with something else. I will leave that to your imagination though. These can be fiddly to prepare but great tasting. As I have said before on other posts these are great for entertaining. They give guests some choice besides store bought alternatives. Heat half the oil in a large frypan over medium to low heat, add the onion and cook for 5 minutes or until softened. Add the garlic, zucchini and carrot, then cook, stirring, for 2-3 minutes until wilted and softened, drain off any liquid or the burger will be soggy. Place bread and chickpeas in the bowl of a food processor and pulse to combine. Add softened vegetables, curry paste, peanut butter, yolk and coriander. Process until mixture comes together, don’t over do it. Form the mixture into 6 patties and chill for 10 minutes to firm up. Heat the remaining tablespoon of oil in a non-stick pan over medium heat and cook the burgers, in batches if necessary for 1-2 minutes each side until golden. Serve in rolls with mayonnaise, chutney, lettuce, tomato and extra coriander leaves. Who doesn’t love a good old Pasta Bake Recipe? This Vegetable Pasta Bake Recipe is only about 5 years old. I love making and experimenting with these. They are easy to whip up and you can vary the recipe according to what vegetables you have in the refrigerator. I have a few of these recipes and will put them all up eventually. This one is versatile as you can leave out the bacon and serve as a vegetarian dish. This dish is also great for getting as many vegetables as possible into the kids in one hit. Enjoy! I got this Low-GI Lentil Patties recipe off the internet about 5 years ago now. I know that I have posted a few “Bean Burger” recipes but I have a lot more too. These recipes are handy to have if you are vegetarian, vegan or know people who are. When entertaining it is more important these days to have choices available. Years ago you didn’t have to worry so much about preferences. These days people are on different diets for personal reasons and medical reasons. So this being the case you do have to think outside of the box when entertaining. Having said that, this recipe is Vegan Friendly. This Prawn and Asparagus Stir-Fry Recipe is a change from the usual meat and 3 veg. meal. After all Seafood is an important part of a healthy nutritional diet. What better way to get the Seafood fix than a Stir-Fry! Although I have had this recipe for years, I haven’t made this one in ages. Maybe I should buy some prawns and get cooking now that the asparagus is back in season here. Anyhow give this one a go and enjoy! Here we are yet again with another Vegetarian Burger. 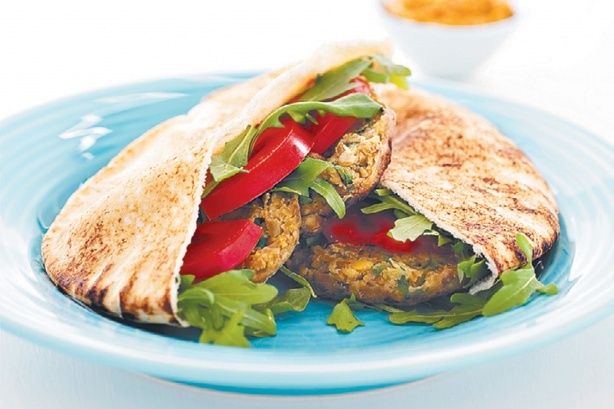 Lentil and Potato Burgers are sure to pique your interest. There are a lot of flavours in this one as you can see from the huge ingredients list. If you prepare all of the items and bowl them up, as I do, it makes the job easier. Especially good if you are prone to being interrupted when cooking. How many cups of flour did I just put into that? Was it 2 or 3? Sick of re-sifting, I decided to bowl up years ago. Again I will mention that burgers like these are great for providing some point of difference when catering to crowds or just family and friends. They make things much more interesting, don’t you think? Anyway enjoy! Place lentils and potatoes in a saucepan with 2 cups of water. Bring to the boil, reduce heat and simmer, stirring, for 15 minutes until tender. Drain. Heat 1/2 tablespoon of the oil in a frying pan over a medium heat. Cook the onion for 3 minutes, then add garlic and cumin. Cook for 30 seconds. Add lentils, potato and feta. Mash until combined, remove rom heat and add tomatoes, coriander and mint. Season to taste. Using wet hands, form into 12 patties. Dip into beaten egg and coat in breadcrumbs. Chill for 30 minutes until firm. Heat a non-stick frying pan with half the remaining oil over a medium heat. Cook burgers in batches for 3-4 minutes each side until golden. Drain on paper towel. Serve with yoghurt. Beef Stroganoff a Great Cheap Eat! This Beef Stroganoff Recipe is very easy to whip up. There are only about 6 ingredients if you don’t count the frying oil and the garnish. How simple is that. Also this meal is relatively cheap to make as well. The only draw back is that there is a pre-packaged mixture which normally I wouldn’t use when cooking. We like to cook from scratch around here. However this is a quick go to meal when you are out of time and ideas, which happens to us all at some time or another.Enjoy! Heat oil in a heavy based frying pan. Add onion and cook over medium heat for one minute, then add beef and brown. Add the Beef Stroganoff Mix and mushrooms. Bring to the boil, simmer for 5 minutes then stir in sour cream. Serve with steamed long grain rice and garnish with roughly chopped parsley. This Mushroom and Lentil Burger Recipe is the last in my Vegetarian Burger series. Unless I find more, this is the extent of the collection. There are enough Vegetarian Burger Recipes on this site to give you enough variety, whether you are cooking for your family or just using these when guests come over. This recipe is quite simple and does not take long in preparation. No food processor required for this one either. Please come back to these recipes every now and then and try them out. Enjoy! Combine lentils, garlic, mushroom, breadcrumbs, egg and egg whites in a large bowl. Season with salt and pepper. Divide mushroom mixture into 4 equal portions. Use your hands to shape each portion into an 8cm patty. Set aside. Heat 2 teaspoons of the oil in a large non-stick frying pan over medium-high heat. Add the onion and cook, stirring occasionally, for 8 minutes or until brown. Transfer to a heatproof bowl and cover with foil to keep warm. Heat the remaining oil in the same pan over medium-high heat. Add the patties and cook for 5 minutes each side or until brown and cooked through. Place bottom halves of rolls on serving plates. Top with salad, patties, onion and remaining bread. Serve immediately.